Full animated. Merry Christmas to everybody. This is one of the best Santa's I have seen so far. Awesome graphics and animations. Love it!!!!! I will use this as my winter default cursor. Really nice cursor! Looks reall good, definately a 10 if I could vote for it. Great job, I'm definately in the holiday spirit now! Great cursor lgp85, very well done. lgp85, you have done a wonderful job on this cursor. The graphics are great and the animation is very clean. I really like your choice for your Busy cursor, the animation in it is flawless. I love it but how come he says jo jo jo and not ho ho ho? Again I thank them comments, It's always welcome, and excuse I didn't keep in mind that "jo jo jo" is in Spanish. 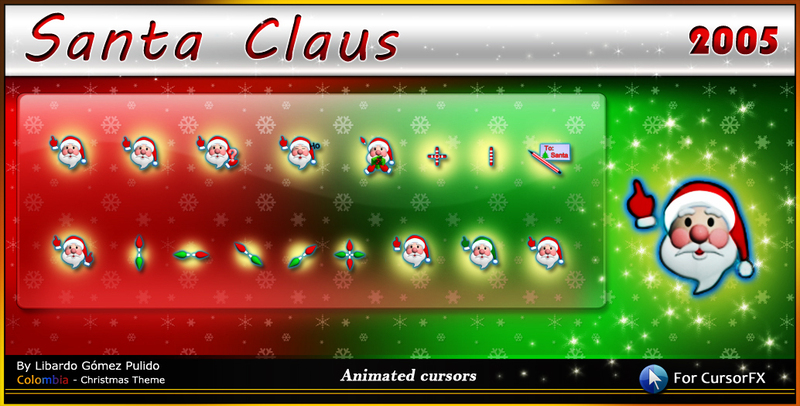 This is the best Santa cursor I have used!! I love all the animations. It is super!! Thanks so much, and good luck in the contest!! Ho ho ho! Santa Claus is coming to town... *sings poorly* Cute Santa cursor! This is one of the best Christmas cursors I have ever seen...I just downloaded it and wanted to tell you! Definetly 5 stars from me!!!!! Hahaha, definitely one of the best cursors I've ever found on here and absolutely the best Santa cursor to be found anywhere! Thank you so much, this is VERY appreciated. Eh, it's okay. Nothing amazing but pretty good.